A former Tribune Company employee could face as much as 25 years of jail time over federal charges accusing him of conspiring with members of the hacker group Anonymous to hack into a Tribune website. 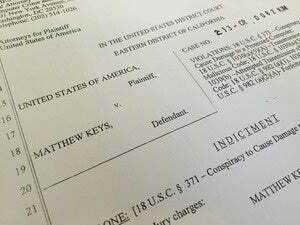 If convicted, Keys could face 25 years in prison, three years of supervised release and a fine of $250,000 for each count, according to a press release from the Department of Justice. An Anonymous hacker ultimately made changes to the Web version of a news article by the Los Angeles Times, another Tribune property, the DOJ said. The hacker altered the headline in the story to read, “Pressure builds in House to elect CHIPPY 1337,” according to the indictment. In an online chat, Keys responded, “nice,” according to a transcript included in the indictment. “It was part of the conspiracy to log in without authorization to Tribune Company’s content management system for the purpose of learning how to alter and damage it,” the indictment states. Reuters did not immediately respond to multiple requests for comment. The Tribune Company declined to comment.